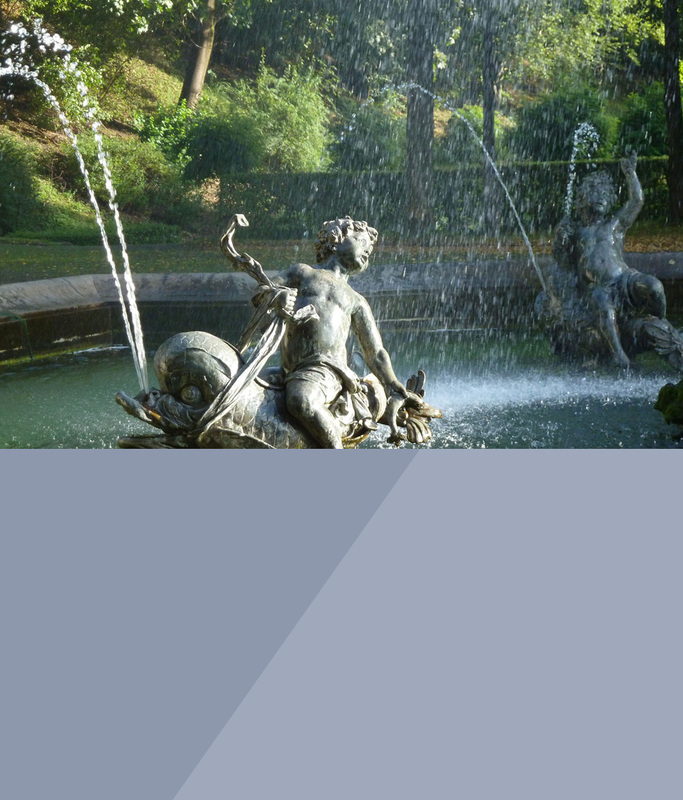 Syntagma has become member the renowned German-Chinese Business Network, DCW e.V. Based on its profound knowlegde of the Chinese language, culture and society combined with its in-depth communication experience in high-tech/IT, business and finance, Syntagma is able to provide a profound contribution to German-Chinese cooperations via this network. The new handbook about communication and integration regarding the professional education of refugees in Germany is now available. It contains a lot of hands-on tips and materials. In an article I give a best practice example of the professional education of refugees in Bavaria launched and coordinated by the Bavarian Ministry for Education, Science and Art. Reisach, Ulrike (Hg. ): Kommunikation und Integration: Ein Handbuch für Akteure in der Flüchtlingshilfe. 270 Seiten, Achter Verlag, März 2017. ISBN 9783981767445. http://www.achter-verlag.de/informationsmedien-fuer-gefluechtete-ein-internationaler-vergleich/. Non-profit article for a book project about the latest developments in professional education of young refugees in Bavaria, Germany. Article is only available in German. A warm welcome of the new Chinese year of the monkey was celebrated at the Bavarian-Chinese Spring Festival on March 3, 2016 with about 600 guests in Munich. 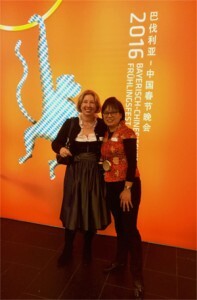 The entertaining evening program was complemented by an talk of the Chinese-German Journalist Felix Lee and a high-grade panel discussion. The overall question was: Which path will China take, facing the declining economic growth and the challenges in the country? In his talk “We will manage it! China on its way to a new economic framework” Felix Lee emphasized that although the growth rate is declining, an economic growth of 6.5% is still expected and has also been defined in the new 5 Years Plan for each year. This is more than any European country may dream of and may be better for the Chinese society and environment on the long run than a two digit megagrowth per year. China is changing from the global workbench to a society where service, innovative technologies and consumption will be the main drivers. According to his studies the atmosphere among Chinese people is not affected by these overall tendencies. At Chinese New Year more electronic Chinese Hong Baos, the red envelope containing a gift of money, have been exchanged than ever before: 8 Billion hong baos were sent by using WeChat at New Year’s eve! 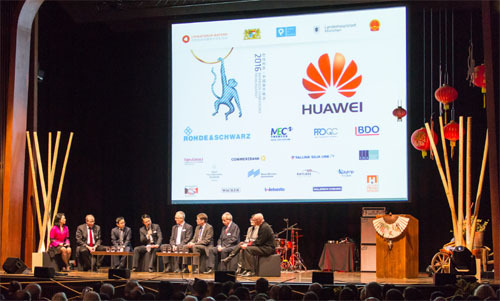 In the panel discussion representatives of the Bavarian Ministry of Economy, Invest in Bavaria, the Munich City marketing and representatives of Huawei and a German Company took part. 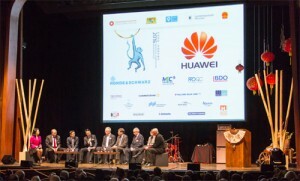 Walter Haas, CTO of Huawei, emphasized the commitment of Huawei in developing the new mobile communications standard 5G in cooperation with the Bavarian Ministry of Economy and leading German companies like BMW. 5G will play a key role in assisted driving technologies and in Industry 4.0. We are celebrating 20 years Syntagma! And we found it was time to launch a redesign of our company image. The new logo stands for our three core areas communication; patent translations, professional translation and transcreation. And in addition our long-term Chinese expertise is represented by the character 德 (de), which stands for Germany (德国) and the German language, but is also one of the keywords of Chinese confucianism and denotes the traditional value of “virtue”. The new logo was developed by X-Space. Starting 2015 we have enhanced our language offering for patent translations with French (DE/EN-FR, FR-DE) and Japanese (DE/EN-JA, JA-DE).